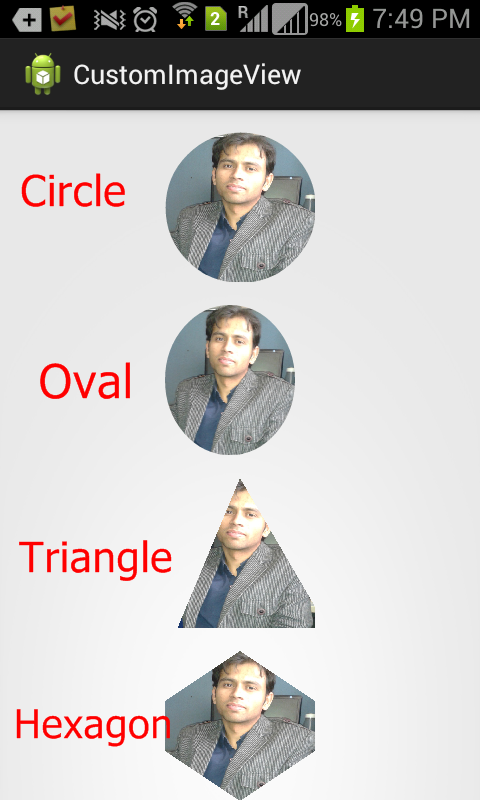 Today I am sharing an article for custom shape image-view in android using canvas. There is no library needed, using canvas you can make any type of shape with simple java code. You can make any shape like- circle, oval, triangle, Hexagonal or any thing else. Below is the code copy to them according to your need. For more help or suggestion post your comment. This demo "ok" for static image view. But my Requirement is: Create dynamic "Circular ImageView" and image Load from URL. So just use above code for your dynamic image. Just use above canvas for your row.xml for imageview. how do i compress and expand an image with fingers , android code pls..? Thank you very very much Manish, well Done!!!! In this u r showing small circle..
For that what can i do...? Hi manish thanks for posting this good tutorial, actually i am facing a problem like if i increase the width and height of the image view the actual image ill not showing in the imageview so please guide me to overcome from this issue. This tutorial worked so smoothly....thanx a lot. what is the library of roundimage to build? No library required, just use given canvas. i m new to android ... u made classes for shapes but where did u instantiate classes in main activity ???? Please check activity_main.xml, I am using that shape as VIEW with package name. I don't think Java have shape for heart. You can achieve it using SVG file, please Google for it. Can u please tell me hw to draw a semi circle imageView. A class that inherits from Image View. 2)In Adapter class load the row.xml and your adapter must extend Base Adapter. 3)in your row.xml use the canvas of shape like- com.manish.MyCustomShape. Thank you for your answer, I have a question, I'm using images with extension .jpg instead of .png, it has something to do? Other thing is this line in your activity: Bitmap icon = BitmapFactory.decodeResource(getResources(),R.drawable.pic1); I don't use that line. In my adapter, I set a background drawable to the Image View. What about the square image ? i can't find the square.java file can you please send me this code? Why you need square image shape? Android res provide us square shape so we don't need canvas. well you can create shape too it is not much tough. You can get code for that on stackoverflow. 1)If you are trying to display in list-view then inside base adapter convert your image URL to bitmap using lazy loading and set it on your image-view. 2)If you have 1 image inside activity then just convert it into Bitmap and set on your ImageView. Thanks,you save my day ! your code is work fine when i added a button for taking gallery image before that app is crashing.plz help me sort out this problem. share your log cat please. I think you are using a big size of image to set into small size of imageView. So solution is before setting into imageView resize your image. you will find code to resize image on stackoverflow. Some thing like height/4, width/4. Thanks, I am sure you are righte I'll see how can I fix it. This project have no dependencies, just copy the canvas file and call inside your layout with package name. can you help me to get out of this problem. I am not able to use getResources() function because I have created a custom adapter and extending ArrayAdapter. and use this contex with getResoucres(). baki sab theeek hai, ye batao ke custom view ke bahar border kaise denge.